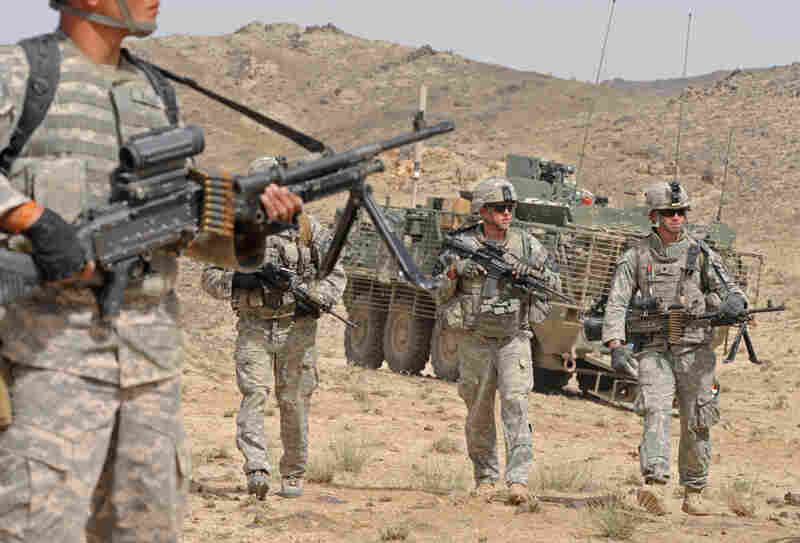 Concern Grows Over U.S. Strategy In Afghanistan President Obama's counterinsurgency strategy involves injecting 30,000 more U.S. troops into Afghanistan to battle the Taliban and bringing in civilians to build the country's infrastructure and civil society. But questions abound about whether the ambitious plan is working. U.S. soldiers on patrol May 8 in Afghanistan's Kandahar province. President Obama's two-pronged plan to combat the Taliban and rebuild the country's infrastructure and civil society is under scrutiny. When President Obama announced the new counterinsurgency strategy for Afghanistan in early December, critics and supporters described the plan as ambitious and optimistic. But now questions are growing over whether the new strategy to turn things around there is working. Gen. David Petraeus, the head of U.S. Central Command, is scheduled to return to the Senate Armed Services Committee on Wednesday to resume his testimony about operations in Afghanistan. Before the hearing was interrupted Tuesday, when Petraeus became faint and later recovered, he came under sharp questioning. Republican Sen. John McCain of Arizona, who has backed President Obama's troop increase, raised concerns that a "mounting crisis" may be developing for the U.S. in Afghanistan. 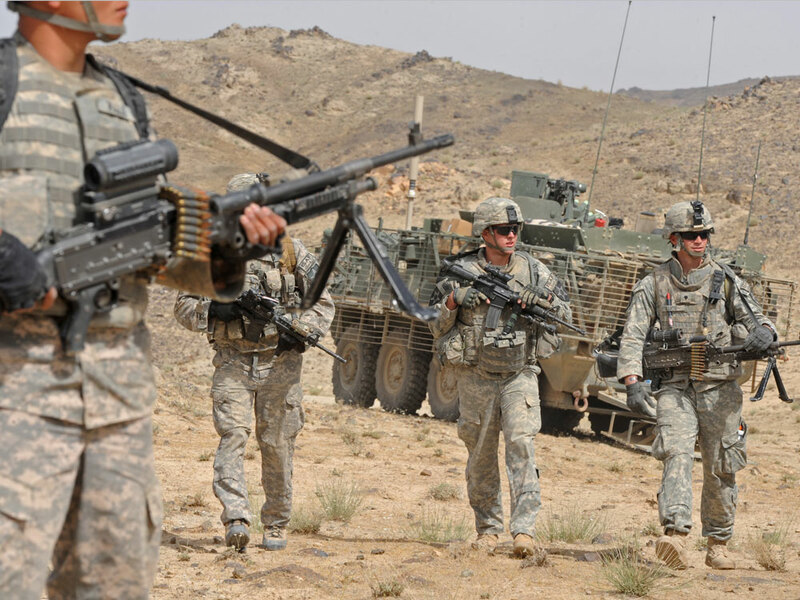 The U.S. strategy involves injecting 30,000 additional U.S. troops into Afghanistan to battle the Taliban and other insurgents, particularly in the south, and bringing in an army of civilians to build the country's infrastructure and civil society. Bruce Riedel, a senior fellow in the Saban Center for Middle East Policy at the Brookings Institution, headed up the administration's first review of Afghanistan. Riedel says the Obama administration knew what it was up against when it unveiled the new strategy. It's always been clear to those who looked at this closely that this was going to be a tough, tough fight, and it's turning out to be a very tough and difficult operation. "It's always been clear to those who looked at this closely that this was going to be a tough, tough fight, and it's turning out to be a very tough and difficult operation," he says. Obama has said he wants to begin withdrawing U.S. troops in July 2011. Steve Coll, an Afghan specialist at the New America Foundation, says a counterinsurgency campaign usually takes about a dozen years to succeed -- if it succeeds. Coll says the Obama administration opened itself to future criticism with the 2011 deadline. "The Obama administration's strategy presumed that visible progress would be made in a matter of months. I always thought that as a tight timeline," he says. Coll says that is especially true when the type of progress that they've been looking for is "eye of the beholder" progress -- in other words, when there are no firm metrics about when the population tilts decisively against insurgents. Daniel Markey, a South Asia expert with the Council on Foreign Relations, says the huge deployment of military and civilian personnel raised expectations. He says that led many people to anticipate that the U.S. was going to quickly turn things around, at least on the military front. But that wasn't the result of the U.S. offensive into the southern district of Marjah in February. Markey says he thinks the U.S. military suggested Marjah would be a model or test case -- even though it knew the operation was going to be difficult. It's early. Everybody involved, including the skeptics about the new strategy, recognizes that it's going to be at least December before you can begin to judge the prospects in 2011 and 2012. "I think even they have been surprised by how poorly the post-initial military operations have gone," he says. Now, Markey says, the U.S. generals are adjusting their plans, which is not uncommon in counterinsurgency. A major offensive against the Taliban stronghold of Kandahar was supposed to be under way by now. Instead, U.S. military officials say it's being pushed back while they build up local public and political support for the operation. That includes bringing Afghan President Hamid Karzai to Kandahar to talk with the tribal elders. But Karzai has been erratic and sometimes counterproductive to U.S. efforts to implement its strategy, Markey says. Markey says the administration doesn't have a firm policy on how to handle the Afghan president. "I would say the administration has gone back and forth on its political strategy, beginning with a lot of sharp criticism of Karzai in the early days after the administration came into office and now shifting to a lighter touch," he says, adding that none of these approaches has "born quick and easy fruit" on the political front. Coll says there are some positive signs. He says Pakistani military and intelligence officials are still ambivalent about how to pursue their interests in Afghanistan and whether to break completely with the Taliban. At the same time, Coll says, they have taken on insurgents on their own soil, something they wouldn't have done a few years ago. In another example, the Afghan National Army holds promise if they can get enough trainers in Afghanistan, Coll says. But Riedel says that will require resources and the hundreds of trainers promised by NATO allies have not been provided. "We've had a very difficult time finding enough trainers who can go in there with the language capabilities, with the training capabilities to start building up the Afghan army and, even more difficulty, the Afghan police, fast enough," he says. Coll says this is all part of the mixed picture coming out of Afghanistan in the six months since the strategy was unveiled. "It's early. Everybody involved, including the skeptics about the new strategy, recognizes that it's going to be at least December before you can begin to judge the prospects in 2011 and 2012," he says. In the meantime, Obama will be getting regular reviews from his commanders in the field.